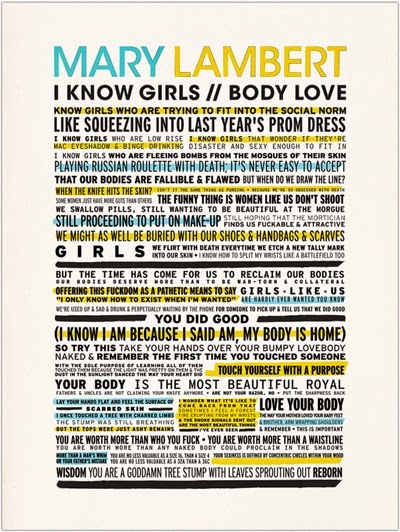 This past month (Grammy-Nominated, Capitol Records Recording Artist) Mary Lambert reached out to FYM to design 18x24 lyric posters for two of her songs--- She Keeps Me Warm and I Know Girls (Body Love). 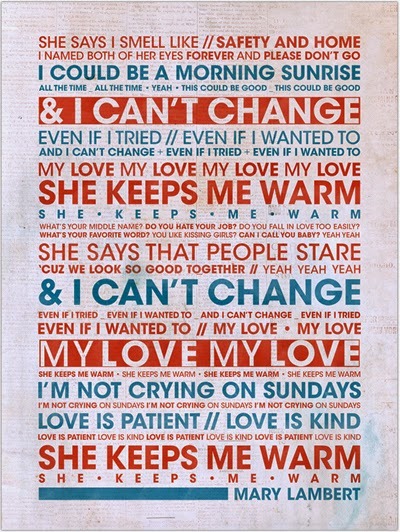 My design concept above for She Keeps Me Warm, was to make this song visually feel like a patriotic statement. I used various weights of the same typeface, as well as color-blocking, and a newsprint texture in the background to make the lyrics speak for themselves. My second visual interpretation of She Keeps Me Warm, is more straight-forward. I took the tune for what it is... a beautiful love song (as opposed to a political statement). There were two variations of this poster (the other is a light 50's blue). I liked the idea of including her photo and doubling up the lyrics to balance out the design. 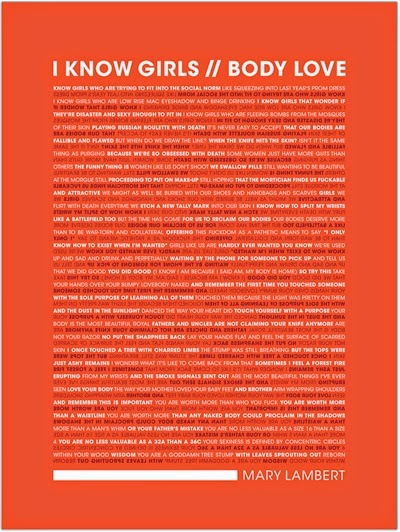 I Know Girls (Body Love), was a very challenging piece to design. The poem itself is around 60 lines of text, and it's also a very intense statement---emotionally uplifting while being brutally honest. For my first interpretation I decided to focus on BOLD color, while creating a modern layout for people to easily read Mary's empowering statement. The next, I focused on the spoken word vibe of I Know Girls (Body Love). I wanted to create a graphic that gave off a textbook/notebook feel (including highlighter marks and blacked out lines). This design is my personal favorite, and the detail shows off well when blown up to 18x24. 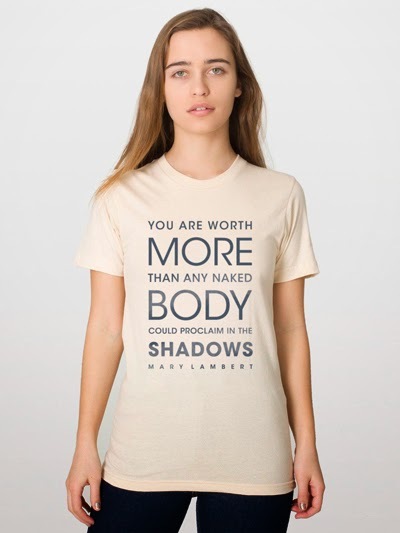 Up next Mary asked FYM to create a couple t-shirt designs using a line from I Know Girls (Body Love). The layout for the quote was pretty obvious for me. I wanted MORE and BODY to stand out on this shirt. For the next design I simply hacked More/Body to add a more dynamic take on the simple layout statement. 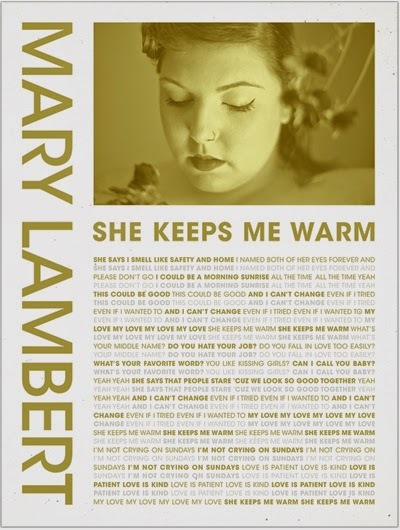 Find Mary Lambert on tour with Matt Nathanson and Gavin DeGraw this summer. More info HERE. Cheers, FYM. They Live!